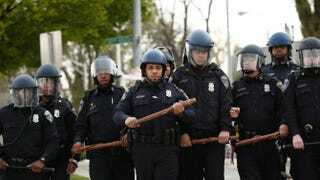 Police officers in riot gear walk toward protesters along Reisterstown Road near Mondawmin Mall in Baltimore April 27, 2015. Traister’s equating of the eruption of violence to the actions of police is an important historical distinction. Whose violent acts actually begat the current crisis? The Baltimore Sun reported in September that in the preceding four years, “more than 100 people [had] won court judgments or settlements related to allegations,” against police, “of brutality and civil rights violations.” Reporter Mark Puente detailed the “head trauma, organ failure and even death” awaiting victims. But this was not when the violence first broke out. Look back to 1997, when Christian Parenti explained that “police violence is soaring.” “By mid-August of [that] year Baltimore police had already shot more than 70 civilians,” he added. It was the dawn of the “zero tolerance” era. The approach directed cops to “stop, frisk and arrest vast numbers of young black and Hispanic men for minor offenses,” Jeffrey Rosen explained. The city’s population was 640,000 in 2005. There were more than 100,000 arrests that year. But violence had hit Baltimore five years earlier. Raymond Petty drove there from Halifax, Va., to visit his sister Hazel in June 1964. She was ill and the outlook was not good. Raymond Petty was in a mild car accident after arriving. His brother Louis was at the scene; the cops arrived. The Afro described how policemen bludgeoned Louis “although they had arrested him illegally, and continued to beat him in a patrol wagon while transporting him to the police station.” He was dead two days later. And before that, in 1956. There were five police killings in four months. Patrolman Charles Fennell shot Harry Boyd Jr. in the back on June 25. Patrolman Walter Mina Jr.’s bullet wounded Robert Harper in the leg on July 7. The blood drained from Harper’s injury until he died. On Aug. 15, Sgt. Albert Heck killed 24-year-old Frank J. Williams. Patrolman Benjamin Ledden opened fire on Sept. 19—in self-defense, he insisted—terminating Donald Jackson’s life at 23. Patrolman Marshall V. Brewer took out 14-year-old Benjamin Brown with a rifle he “didn’t know was loaded.” Of these five policemen, only Brewer was suspended. Those were just the 1956 shootings. The Afro’s Elizabeth Murphy Oliver wrote of her visit to the Northwestern police station that September. What she saw shattered her. She “hoped it was a dream.” It wasn’t. She had witnessed “a policeman beat a man and drag him roughly on the floor while the victim writhed and rolled in agony.” Vernon Johnson “was still sobbing and holding his eye” when it ended. “Blood was dripping from somewhere.” Oliver “wondered how an eye could run blood,” as she watched Johnson’s tears fall, “mixed with blood.” The Afro visited Johnson a week later. “His eye is still closed. He doesn’t sleep much, and his chest hurts when he breathes.” But 1956 was hardly the beginning of police brutality. No. In February 1942, Patrolman Edward Bender shot his second black victim, Thomas Broadus, as he fled. His friends rushed over to take him to the hospital. Bender blocked them, and Broadus died in the street before “scores of persons,” according to the Afro. Eleven years prior to that, Officer Charles Harris shot Roland Freeman dead on Nov. 14, 1931. On March 29, 1930, the Afro wrote that “Officer Herman Trautner, white, killed Roosevelt Yates, an unarmed man he was seeking to arrest.” “The trouble is police brutality in Baltimore has gone as far as some people are going to stand,” the paper warned 85 years ago. “To us,” Baltimore resident D. Watkins explained last week, the city’s “police department is a group of terrorists.” Major news outlets talking about violence in Baltimore recall the fish in the joke: “How’s the water?” the fisherman asks. “What’s water?” replies the fish, oblivious to what makes its world. Like the establishment media, unaware of the violence shaping theirs. Editor’s note: A version of this article was originally published in CounterPunch. Nick Alexandrov lives in Washington, D.C. He is a history graduate student and regular contributor to CounterPunch. He can be reached by email.